To open the Snap Camera settings, select the Settings icon in the top right corner of Snap Camera. If you have multiple webcams connected to your computer, you can select the webcam you want Snap Camera to use. Select the camera in the Choose Your Camera dropdown. If you would like to modify the resolution or frame rate of your web camera, you can do it in Settings. For best quality and performance please make sure that resolution and FPS settings in Snap Camera match those in OBS or your other app of choice. Please note that this feature is available only on Windows for now. The output of Snap Camera is not-mirrored for the best viewer experience. For the Snap Camera preview, we flip the video preview so it behaves like a mirror. Disable the Flip Video Preview toggle to preview exactly how viewers will see the non-mirrored output. 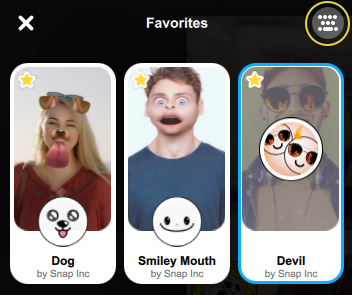 Any Lens you use in Snap Camera can be unlocked by scanning the Lens Snapcode. You can easily share the Snapcode of the Lens your are using to your viewers by enabling Show Snapcode Overlay. This feature is for sharing Lenses on non-Twitch platforms. For Twitch users, follow the Twitch Extension guide. For more information on unlocking Lenses via Snapcode, check out the Unlocking Lenses guide. The following hotkeys can be configured in the Snap Camera settings. The Turn Lens On / Off feature will toggle if the Snap Camera Lens is active. This allows you to easily switch between using a Lens and not mid stream. To assign a hotkey, click the Add Hotkey button, input the hotkey and then click Save. The Trigger Lens Effect feature will trigger an interaction in the selected Lens if supported. Lenses that utilize a full screen tap can be triggered with this hotkey. To assign a hotkey, click the Add Hotkey button, input the hotkey and then click Save. Favorited Lenses can be bound to hotkeys. This allows you to easily enable your favorite Lenses mid stream. To configure your favorite Lens hotkeys, first click the Favorite button in the top left corner of Snap Camera. Then, click the Favorite Hotkeys button in the top right of the Favorites section. Next, you'll be able to configure hotkeys for each of your favorite Lens. When the hotkey is triggered, the favorite Lens will be activated. To assign a hotkey, click the Add Hotkey button, input the hotkey and then click Save. You can adjust the cache size Snap Camera uses and also clear history by clicking the View button underneath Cache & App Use. Once selected, you'll be able to configure the cache and history.